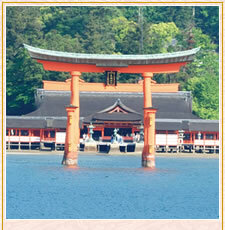 The true value of Miyajima as one of the three most scenic views of Japan rests with the view from the mountaintop. An air walk on the ropeway gondola is another attraction of Mt. Misen sightseeing. You can enjoy magnificent views of the Seto Inland Sea and Miyajima’s primeval forest, as if you were walking in the air. Before your eyes is a 360-degree panoramic view. Feel the beauty of the magnificent Seto Inland Sea, dotted with hundreds of islands. You can command a panoramic view of the many islands dotting the Seto Inland Sea. This panoramic view never bores people and moves the hearts of visitors. You can move this photograph from side to side by dragging the screen. Shishiiwa Observatory, located next to the terminal of the ropeway, can also offer an amazing view, comparable to that of the summit. The observatory, located by Shishiiwa Station, is a great spot to view the magnificent Seto Inland Sea, dotted with many islands..